When the first strains of cool weather hit Vancouver air, I realized with horror that I'd left my handknit mittens in a pink milk crate at my parents' house. Given that I'd sworn never to wear storebought mittens again, I ran out to a west coast knitting store to stock up on something to knit up some new ones, quick. Enter three bags full, a beautiful wool store close to my new apartment. I bought Noro Kureyon (also a first for me) and set to work. At the time, I'd just finished the first of two Pomatomous socks, and was suffering serious laceweight + twisted rib + second sock syndrome pains. The speed with which these mittens practically appeared to me, as if in a dream, as if I hadn't been knitting them at all, was wonderful. 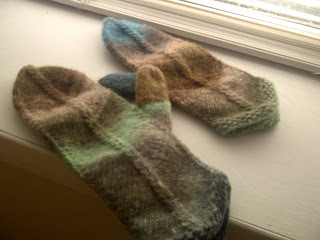 Elizabeth Zimmermann, your mitred mittens are genius. The colours of the Noro I chose blended together to look a little like mildew, which gives me some strange pleasure. Also, I love that the mittens don't match, they just go. I will definitely make this pattern again.